Here are some snazzy birthday facts about 24th of August 1953 that no one tells you about. Don’t wait a minute longer and jump in using the content links below. Average read time of 10 minutes. Enjoy! What day was my birthday Aug 24, 1953? August 24, 1953 was a Monday and it was the 236th day of the year 1953. It was the 34th Monday of that year. The next time you can reuse your old 1953 calendar will be in 2026. Both calendars will be exactly the same! This is assuming you are not interested in the dates for Easter and other irregular holidays that are based on a lunisolar calendar. There are 125 days left before your next birthday. You will be 66 years old when that day comes. There have been 23,981 days from the day you were born up to today. If you’ve been sleeping 8 hours daily since birth, then you have slept a total of 7,994 days or 21.89 years. You spent 33% of your life sleeping. Since night and day always follow each other, there were precisely 813 full moons after you were born up to this day. How many of them did you see? The next full moon that you can see will be on May 18 at 21:13:00 GMT – Saturday. Fun stat: Your first one billion seconds (1,000,000,000) happened sometime on May 2, 1985. If a dog named Zerkyo - a Shiba Inu breed, was born on the same date as you then it will be 280 dog years old today. A dog’s first human year is equal to 15 dog years. Dogs age differently depending on breed and size. When you reach the age of 6 Zerkyo will be 40 dog years old. From that point forward a small-sized dog like Zerkyo will age 4 dog years for every human year. Julius Caesar’s general Gaius Scribonius Curio is defeated in the Battle of the Bagradas (49 BC) by the Numidians under Publius Attius Varus and King Juba of Numidia. Curio commits suicide to avoid capture. Pope Innocent III declares Magna Carta invalid. The printing of the Gutenberg Bible is completed. Peninsular War: A coalition of Spanish, British, and Portuguese forces succeed in lifting the two-and-a-half-year-long Siege of Cádiz. World War I: The Battle of Cer ends as the first Allied victory in the war. World War II: The Battle of the Eastern Solomons. Japanese aircraft carrier Ryūjō is sunk and US carrier USS Enterprise heavily damaged. The Communist Control Act goes into effect, outlawing the American Communist Party. In San Fernando, Tamaulipas, Mexico, 72 illegal immigrants are killed by Los Zetas and eventually found dead by Mexican authorities. What does my birthday August 24, 1953 mean? 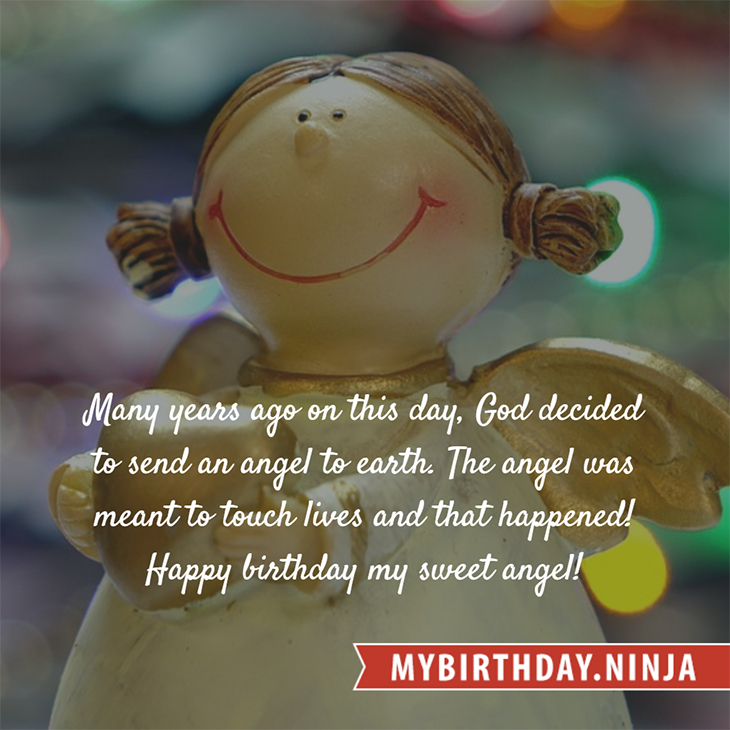 Your birthday numbers 8, 24, and 1953 reveal that your Life Path number is 5. It represents progress, adventure and opportunity. You possess the curiosity of a cat and long to experience all of life. The following celebrities also have the same life path number: Ciara Hanna, Shiho, Ron Howard, Quvenzhané Wallis, Phillip Rhee, Marie-Georges Pascal, Ben Browder, Hiromi Nagasaku, Kelly Slater, Shraddha Das. 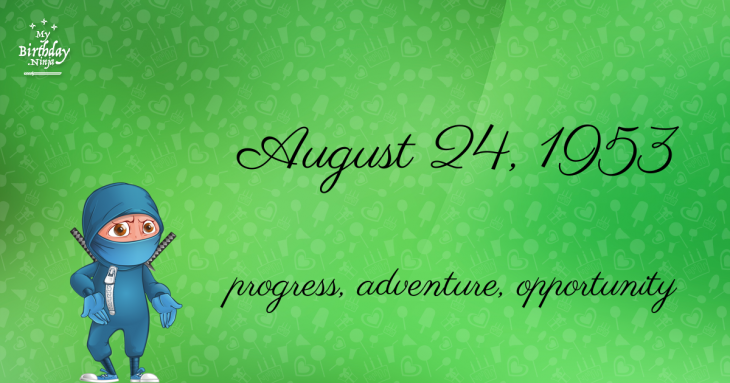 What is the birthday horoscope for Aug 24, 1953? The Western zodiac or sun sign of a person born on August 24 is Virgo ♍ (The Maiden) – a mutable sign with Earth as Western element. The ruling planet is Mercury – the planet of communication. According to the ancient art of Chinese astrology (or Eastern zodiac), Snake is the mythical animal and Water is the Eastern element of a person born on August 24, 1953. Fun fact: The birth flower for 24th August 1953 is Poppy for preparedness. What is the Love Match for Aug 24, 1953? When it comes to love and relationship, you are most compatible with a person born on December 24, 1953. You have a Love Match compatibility score of +154. Imagine being in love with your soul mate. On the negative side, you are most incompatible with a person born on March 2, 1943. Your incompatibility score is -152. You’ll be like a cat and a dog on a love-hate relationship. Arf-arf, I want to bite you. Meow-meow, stay away from me! How many babies were born on August 24, 1953? Base on the data published by the United Nations Population Division, an estimated 97,861,773 babies were born throughout the world in the year 1953. The estimated number of babies born on 24th August 1953 is 268,114. That’s equivalent to 186 babies every minute. Try to imagine if all of them are crying at the same time. What is the popular baby name on 24 Aug 1953? Here’s a quick list of all the fun birthday facts about August 24, 1953. Celebrities, famous birthdays, historical events, and past life were excluded. Try another birth date of someone you know or try the birthday of these celebrities: June 4, 1907 – Rosalind Russell, American actress and singer (d. 1976); April 16, 1949 – Pirkko Saisio, Finnish actress and director; October 6, 1991 – Roshon Fegan, American actor, rapper, and dancer.